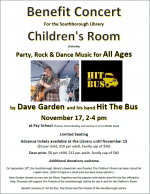 On Saturday, November 17th from 2:00 – 4:00 pm, Dave Garden and Hit The Bus will hold a family-friendly concert at Fay School. The concert is being held in the Primary School building. That means seating is limited – so get your tickets soon. A second incentive for advance tickets is the discount price. Now through Thursday, November 15th the Library is selling tickets for $5 per child and $10 per adult with a maximum of $30 per family. Reminder: This isn’t a “children’s music” concert. It’s one for all ages. We play an eclectic mix of music ranging from the 50’s through today’s hits. HTB plays the music people want to hear, dance and party to! The band offered to hold the fundraiser after hearing about the Children’s Room flood. 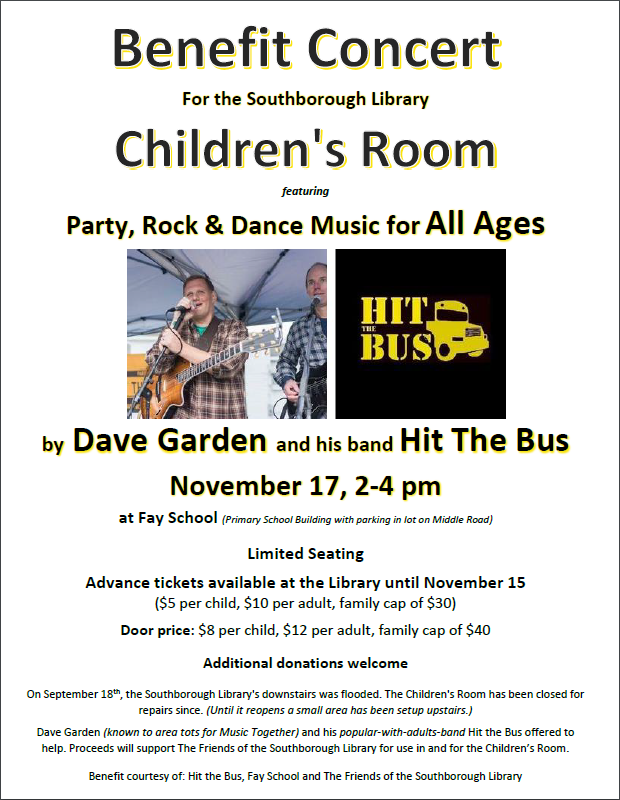 The Friends of the Southborough Library volunteers are helping to organize and put on the event and Fay School is providing the space. Parking for the concert will be in the parking lot on Middle Road. *Full disclosure – as many of you already know, I’m the President of The Friends of the Southborough Library.